It shouldn’t be confused with the traditional American square-dancing. You can often witness a square dance in China. It has long been considered a form of healthy exercise and is a way for senior ladies to have fun and socialize. The Dancing Damas have danced in Sunset Park, the Place du Louvre and even other European landmarks. There is no doubt that the Dancing Damas have become popular. However, the culture and legal issues are quite different here in the United States. These ladies do affect other people’s lives, but there exists a big gap between Western and Asian culture, and there seems to be a resistance in the United States. When the Chinese Dancing Damas dance performed in New York City, they danced since early hours, making a lot of noise. Some of the public could not stand the amount of noise and are were really upset with the performance, and even called the police to restrain them. Every coin has two sides. Such dancing, however innocent, can disturb public peace. We have seen incidents on the Internet where conflicts broke out between residents who could no longer bear the noise. What is a general global opinion of the square dance? Much more positive than ours here in the United States. For example, a dance in the capital of Romania-Bucharest, a group which is called “Red Dragon” would start dancing every night at 6:30 in the northeast suburb of the city. They not only brought a lot of fun to the neighborhood, but also attracted more local people who can engage in the dancing. 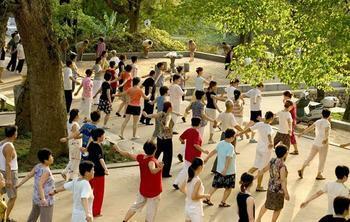 Chinese square dancing has had a difficult time surviving outside China. The key is how to resolve conflict between two different cultures. We hope our compatriots planning to go and live abroad learn to respect a local way of life and tradition. Jingyu Zahng can be reached at info@nwasianweekly.com.